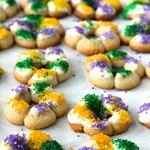 These King Cake Spritz Cookies look like tiny versions of the traditional New Orleans Fat Tuesday cake. 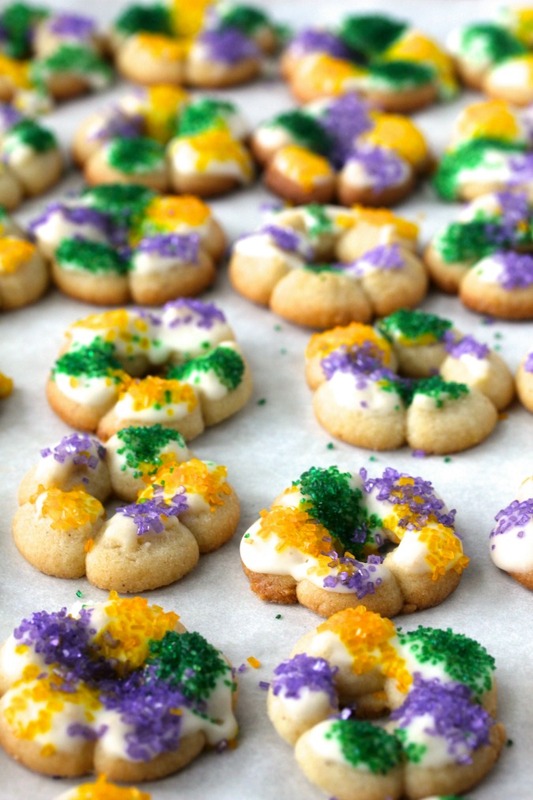 No, there is not a tiny baby Jesus baked into these King Cake Spritz Cookies, but don't they look a lot like the mini versions of their inspiration? Traditional King Cake is an enriched, sweet, yeasted holiday bread flavored with nutmeg and cinnamon, and topped with a powdered sugar glaze and sprinkled with purple, green, and gold sparkling sugars. The purple represents justice, the green represents faith, and the gold represents power. The three colors also represent the Three Kings. I bet you've noticed that my sprinkling skills are "rustic." While I don't have a photo of a proper King Cake to post here, if you google King Cake, you will see that the sprinkles on them are pretty messy too. So my cookies are authentic, right? You could actually use one of these cookies in Fat Tuesday diorama! I have faded memories of making spritz cookies at Christmas with my mom. She wasn't much of a baker, so I can't even imagine that she owned a cookie press, but I do remember using one in our kitchen as a teenager. This last Christmas, I ordered this cookie press, and immediately fell in love with spritz cookies! I made them for a couple of cookie exchanges, as well for Christmas Eve. They are fun to make with kids, although my youngest grandson did run around clicking the cookie press like a gun. Boys! This recipe is pretty simple and very forgiving. If you mess up, you can scoop up the dough and place it back into the cookie press. Do not use nonstick cookie sheets. For best results, use parchment paper or ungreased cookie sheets. The dough should be moist and at room temperature in order to pass through the cookie press and stick to the cookie sheet. Do not chill the dough. Place the cookie press directly on the cookie sheet and then press out the dough with one click. Lift the cookie press straight up off of the dispensed dough. There are lots of disks in this cookie press that you can make cookies for all occasions and holidays, not just Christmas. Such as Mardi Gras! In the bowl of a stand mixer, mix the butter and sugar with the paddle attachment on medium speed until fluffy. Add the egg, vanilla, cinnamon, nutmeg, and salt, and beat until combined. Add the flour, and mix on low until just combined. Add the dough into the cookie press and add the desired disk. Press the dough out onto the ungreased or parchment lined baking sheets, about one inch apart. Depending on the season, you can either decorate the cookies with sprinkles before baking, or bake them, glaze them, and the add sprinkles. Bake the cookies, one sheet at a time, for 10 to 12 minutes. Cool on a wire rack. 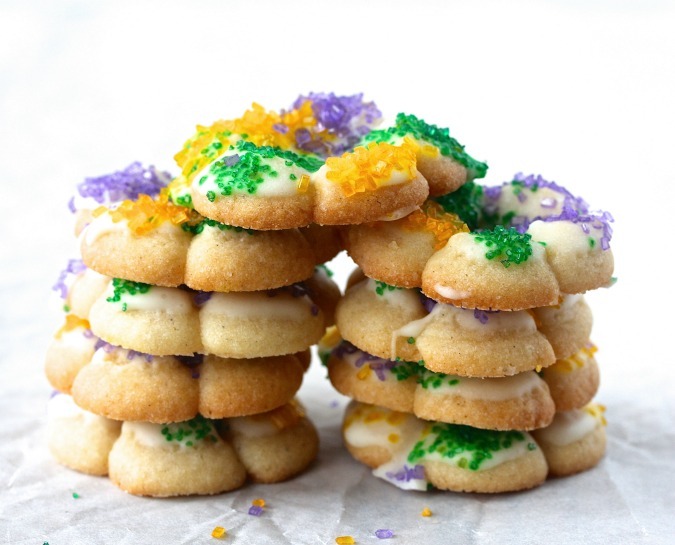 For the Mardi Gras cookies, mix one cup of powdered sugar with just enough water or lemon juice (one teaspoon at a time) to create a glaze you can dip the cookies into. Dip the cookies and sprinkle with the various colored sugars. Let dry for a few hours. Store in an airtight container. These are such fun cookies and I love the sprinkles! Thanks Heather. Sprinkles make everything better! I love spritz cookies and I think your sprinkling technique is on point! They are one little bite of yummy goodness. Thank you for the validation Felice! Those are really beautiful Karen! Exceptional work. We love the aroma these must have, with the cinnamon and the clove. The clove is missing in the ingredients list though; how much did you use for this batch? Thank you my friend with the good editorial eye!! There is no clove! My brain must have substituted nutmeg with clove when I was writing the instructions. I fixed it! P.S. This dough is also good piped out of an icing tip into flowers and shapes. the Bread Baking Queen is now also the Cookie Baker Queen!